Two years ago I attended my daughter’s spring award ceremony, which was held in a small auditorium with seats smaller and harder than the ones at Fenway Park. The stench of body odor was growing stronger as the night wore on. High school award ceremonies are like amateur parades; you can’t wait for them to end. There were at least 12 teams in all, starting with boys and girls track, followed by two-gender-ed sports like tennis, volleyball, lacrosse…until finally my daughters crew team walked onto the stage. Sitting through two hellish hours was worth it because my daughter was given the “Coach’s Award” and named Captain of her crew team for next year. The reason given for her receiving the award and being named captain was because she stepped up and took on responsibilities that no one would. 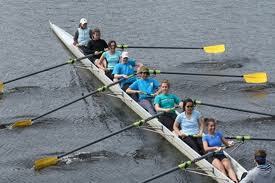 What came of that night was not only the fact that my daughter, who is a coxswain, earned her first major awards as a high school student; it also got me thinking about who stands out at work. Who deserves to earn “Coach’s Award,” “Most Improved,” and “MVP” at work? Here’s my take on award winners at work. Coach’s Award. This award is given to an employee who does everything possible to make her manager’s job easier. She volunteers to take on the mundane tasks of data entry when no one steps forward and won’t hesitate, nor complain, to man the front desk when the receptionist is out. She demonstrates team spirit, always has a positive attitude that shows from her smile and in her eyes. Most Improved. The Most Improved employee is the envy of many in the office because he has overcome his weaknesses and surpassed the performance of those who were at one point in time stronger. He began as an entry level sales person and improved to the point where he’s now challenging the senior sales people. It is through diligence and quick learning that enabled him to make the leaps necessary to supplant some of the other sales people. MVP. The MVP performs her work beyond expectation, is a silent leader with a large presence. She is the thought leader in the organization. The MVP is humble and doesn’t take credit for accomplishments others have achieved. She is affable and a comfort to other employers who may need her guidance, a true mentor. If anyone is indispensably, she is that person. A successful organization, like a successful sports team, requires all three employees among its staff. The employee who earns the Coaches Award is the glue that holds the organization together; the Most Improved gives others hope and something to strive for; and the MVP is simply the most valuable person, yet she doesn’t necessarily know it. Do you deserve one of these awards or can think of someone who does? Why do you or others deserve one of these awards? This entry was posted in Career Management and tagged Coach's Award, Most Improved, MVP, strong organization, the workplace on July 6, 2014 by Things Career Related. It’s important to recognize those that have grown. They might not be the #1 salesperson yet, but to climb from the bottom to the middle is no small feat. That progress deserves a little recognition because it can help keep that employee pushing and striving to improve even more. Yes, Bob. I see those as the most improved. Even if they don’t surpass everyone, they’ve still improved on their performance. And maybe they don’t become the #1 salesperson, and maybe they have to be let go; at least they improved their performance.